I am a passionate golfer. I feel ridiculous even saying that. It’s like passion and golf don’t go together. Golf is such a meticulous sport. So many factors to pay attention to, so much planning. Ideal for people who have a lot of time on their hands. Perfect for individuals who are a little bit OCD. You see – no space or time for passion. Still, I do love it, and I spend a lot of my spare time playing it. For many years, golf was seen as an exclusive sport, reserved for wealthy and privileged. But, its popularity is on the rise for last twenty years. Now, we all know who Tiger Woods is, and we all hear about his strict training regimes, and we would all like to be as good as him. I don’t say it is impossible, but if you want to be that good, you have to devote yourself entirely toa certain lifestyle, increasing fitness level and improving your techniques. Unfortunately, many amateur golfers don’t understand the basics of this magnificent sport in the first place. But, the thing that confuses people the most seems to be the handicapping.What is it in the first place? How do you calculate your handicap? How to improve it? How to maintain it? I am here today to save you, to tell you all about it, to offer you all you ever wanted to know about handicapping and little more than that. So, if you want to find out your handicap and lower it, keep reading, because everything will become much clearer in a minute. Handicaps have been the part of the golf since the beginning, but their versions varied over the time. Sometimes they were less and sometimes they were more confusing than they are today.However, the most important thing that you should know before we dive into history and explaining is that golfers in USA play by the United States Golf Association’s (USGA) system. The research team decided to design a measure that will take account of the overall difficulty of different golf courses, differences between tournament and casual play, compare every individual golfer with others that have different skill level and make sure to adjust aberrant scores on individual holes. This resulted in the set of USGA handicap formulas as we know them today, which were implemented between 1987-1993. 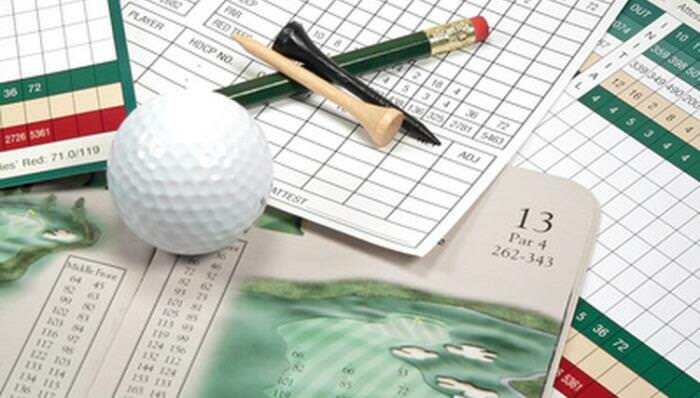 Now that you have all information that you need on the history of golf handicap, we can proceed to explain the terminology and necessary calculations. It may seem confusing at first, but it is really all about simple math once you grasp the basics. 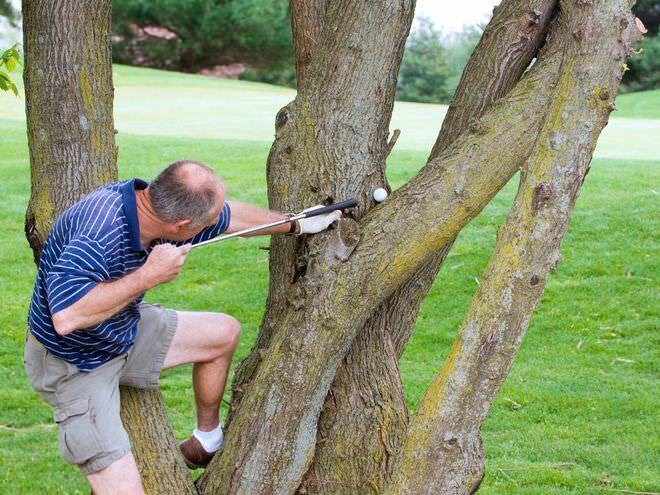 Who is a scratch golfer? What is the adjusted gross score? We’ll address these questions one at a time by giving you the official USGA definitions. By the definition of the USGA, a scratch golfer is "a player who can play to a Course Handicap of zero on any and all rated golf courses. 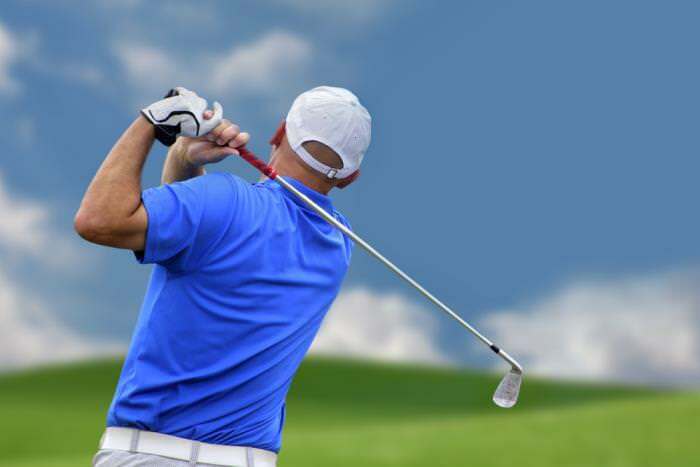 A male scratch golfer, for rating purposes, can hit tee shots an average of 250 yards and can reach a 470-yard hole in two shots at sea level. A female scratch golfer, for rating purposes, can hit tee shots an average of 210 yards and can reach a 400-yard hole in two shots at sea level." 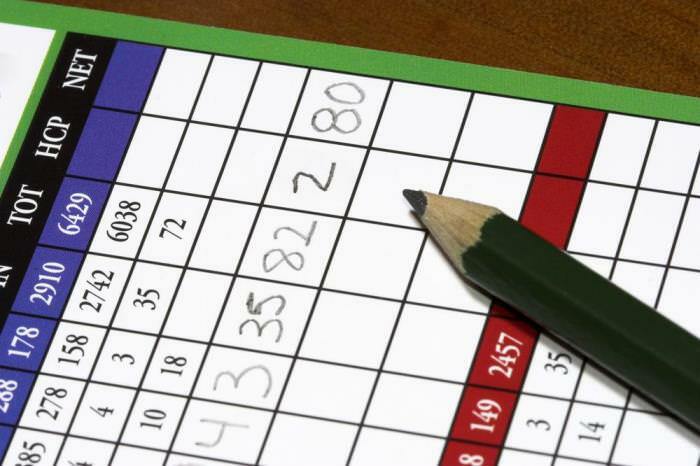 You should be able to find both your course and your slope rating on your golf scorecard. Still, there is another information that you need to have before calculating your handicap. It is your adjusted gross score or equitable stroke control (ESC) score. It is a variable which limits the number of strokes you have to count on an exceptionally bad hole.If your handicap is low, you will have fewer strokes to count. However, if you still haven’t been assigned with a handicap, you’ll have to count the maximum of up to 10 strokes per hole. When you adjust your score for each hole, the only thing left to do is to add them up, and voila - your adjusted gross score is ready. With all of this information, you are ready to calculate your handicap differential for each round. We will explain how to do this in the following section. A golf handicap is in fact, a measure of one’s potential ability. It tells you approximately, how many strokes above or below par a golfer might be able to play. This is based on the ten best scores of your last twenty rounds. However, you cannot get your handicap right after you decide to start playing golf. You need to have at least 5-20 games in your experience before getting this index. Five scores in an 18-hole game will be enough, while for 9-hole games you’ll need at least ten scores. Adjusted Gross Score (or Equitable stroke control, if you prefer) is calculated by totaling up the number of strokes you took during one round and then adjusting that number for the maximum per-hole scores. Maximum per-hole scores are, as you know, determined by the USGA’s ESC guidelines and you can usually find that information on the cou rse’s website or directly at the clubhouse. Slope and course ratings both indicate course difficulty, and they depend on the golf property you played on. Again, it is most efficient to seek for these details at websites or clubhouses. Once you have all of the details, it is all about applying the formula. This way, your handicap differential is 10.6. (Sum of Differentials / Number of Differentials) x 0.96. At last, taking care of all of this data pays off because it gives you an opportunity to keep track of your net score which allows you to compare your success with other players. If you are participating in the match play, net scores will be calculated on a per-hole basis, which will determine the winner of the hole. 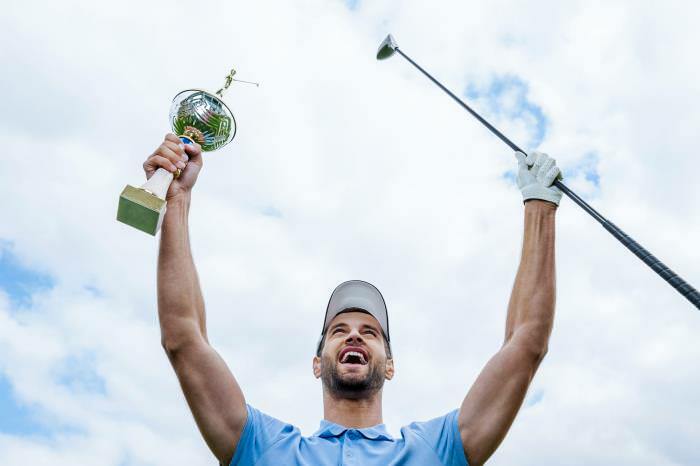 On the other hand, if you start a stroke play, golfers will usually wait until the end of the whole round and then calculate anet score for all 18 holes to declare the winner and placings. After pushing your mind to go back to elementary school state and deal with the algebra, you’ll feel the sudden relief. There will be no more embarrassment or awkward lying when someone asks you about your numbers. You can proudly say that you are keeping track of them and that you calculated them on your own. Congrats, you are now much more serious golfer than you were before. Let’s say that we are now in the limbo between two major topics. We’ve mastered the calculations, but we haven’t addressed the problem of improvement yet. But, I would like you to keep you here, in the middle, for a while. Why is that so? Because I know you still have tons of questions and I would hate to leave them unanswered. I know this for a fact because that’s how I felt when I first started exploring golf and particularly handicapping. My answer came directly from the USGA: men’s maximum handicap index is 36.4while women’s is a little higher - 40.4. Or if you are playing a nine-hole game it’s 18.2N for males and 20.2N for females. If your handicap index is above the allowed maximum, it will be marked with “L” for local club use only. However, if only your course handicap is above the limit, you shouldn’t worry, due to the formula handicap index can be converted to a course handicap number higher than the maximum. Situations like this happen from time to time. Sometimes, the weather will surprise you, or you will let your rival take another stroke out of courtesy, whatever your reasons might be, it will happen from time to time. What should you do with your score then? Do you record it and how? To meet this criterion, you have to be accompanied for at least seven (in the case of a nine hole score) or 13 holes (in the event of an eighteen hole score). Yes, there is. Before I learned that 18-hole game suits me better, I played a little of both, so I wanted to know if I can use these different scores to form one handicap index. The go od thing is, two nine-hole scores can be combined to create an 18-hole score eventually. Just make sure that you are using the appropriate nine-hole course and slope rating while posting your numbers and you should be okay. When I was few years into g olf and it just started to grow on me, I had a car accident. It was nothing major, but I needed a wrist surgery. My wife was all worried and terrified while I thought mainly about golf. Am I allowed to play during my recovery? 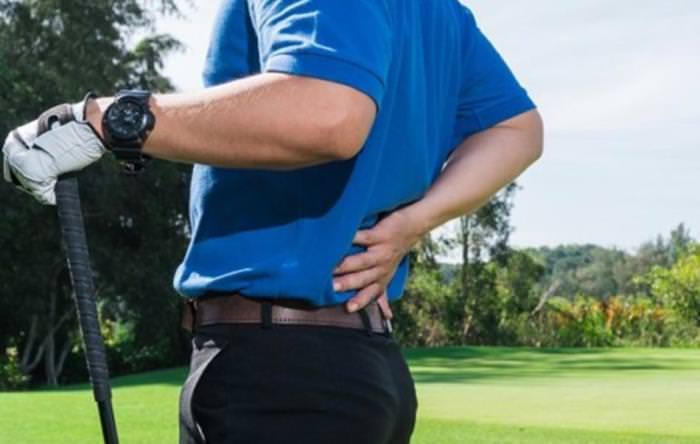 Will this injury affect my handicap index? Is there any way to adjust it, so it doesn’t go down the drain due to my inability to play as I used to? Let’s say you’ve played golf for many years and you actually invested yourself into maintaining a good handicap index. However, for some reason, you made a pause that lasted a few months or years. But, you still remember how good your index was, and you would like to retrieve it once you go back to golfing. What should you do? The golf club or association that last maintained your records should preserve them for at least one year. If you contact them, they should be able to give you your previous 20 chronologically listed scores along with the eligible tournament scores. Once you decide to join the new club, these scoring records should be reinstated.If your previous club or association fails to find your scoring record, but they have your previous handicap index, you can use it until you are able to post five new scores. 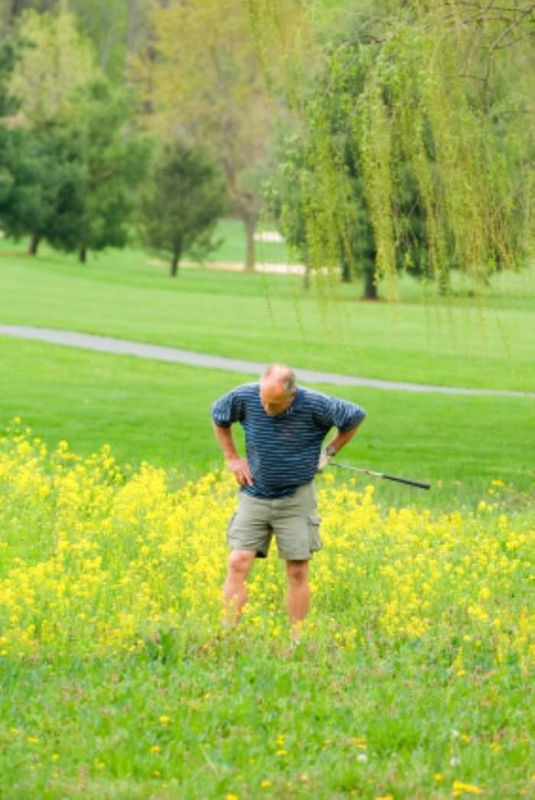 At that point, you will get a new handicap index, for the new club you are playing at. I think that I covered some of the most important questions in this field, but if you have any additional ones, I advise you to go directly to the source of all rules. Do not accept what some shady websites are telling you, look for your answers at the USGA’s web presentation or ask the professionals in your club or association. This is the only way to be sure that you are getting correct answers relevant to your problem. Now, that you passed the torture of learning the theory, we can proceed to the more practical part that is supposed to increase your skills and lower your handicap at the same time. There is no reason for stalling, so I will start with advice on improvement right away. Pay attention, it might be a good idea to prepare a pen for taking notes. Let’s dive in! You can always create a space for practice, almost anywhere you might find yourself. Be that your office, back yard, basement or living room. Get yourself a golf net, and you’re all set for a portable practice space. Take a few shots on your lunch break at the office, stretch around your living room, or set up a place around your house, so you will always have a spot to practice nearby. Best of all options is the range. 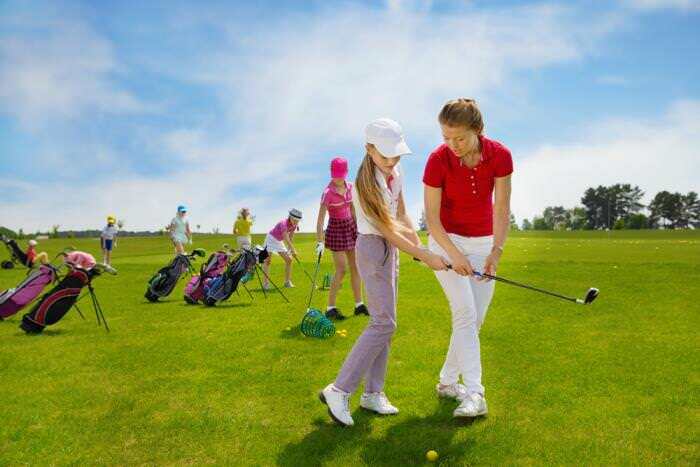 Go to the range as much as you can, that’s the best way to develop muscle memory and reduce the number of bad swings. As much as your long shots, the short ones are as much important. Can you remember the last time you put work on your short game? But really practice it, not just roll a few. Commit to practicing after or before every round for 15 minutes straight. As much as you like playing with a company, try to isolate from time to time and play by yourself. This way you can get more serious and focus on the improvement. Some different researchers found that the athletes are on their peak mental awareness when they train on themselves. When you’re all alone, there’s no one to see your bad performance, with that in mind you will be more relaxed, and those improvements will come faster. Try to go on as much different courses you can. Changing the turf will positively impact your ability to adapt and overcome obstacles, and you will improve your all-around skills. While practicing you will throw a serious number of shots, the more balls you hit, the better you’ll get. That’s the whole point of practice. While you’re swinging at the range, you will send a lot of balls in the sky, and many of them will never be recovered. That is fine when you’re playing your regular game, but when you’re trying to improve your shots, that number of balls will be much bigger. 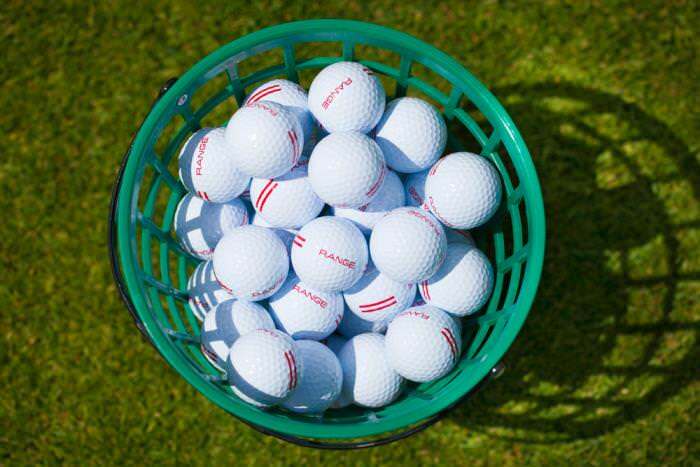 It’s smarter to use inexpensive balls than the real ones for practice. Sure, it might not feel the same, but it’s good enough for practice, and wasting money on lost balls while practicing is pointless. There is a new concept of training balls now available that was introduced last year. You probably heard about it; it’s a hollow plastic ball shaped like a bracelet. It’s specially designed for practice, and it gives you the feel of a real ball. There are also a lot of options for indoor practicing of your short game. Look for balls that are specifically designed for an indoor practice, most of them have the label “Indoor” on their packing. If you want it to be as close as it can to the real thing while you’re at the range, there are options for that too. Ask around the shops for that kind of balls, and they will know what to recommend to you. 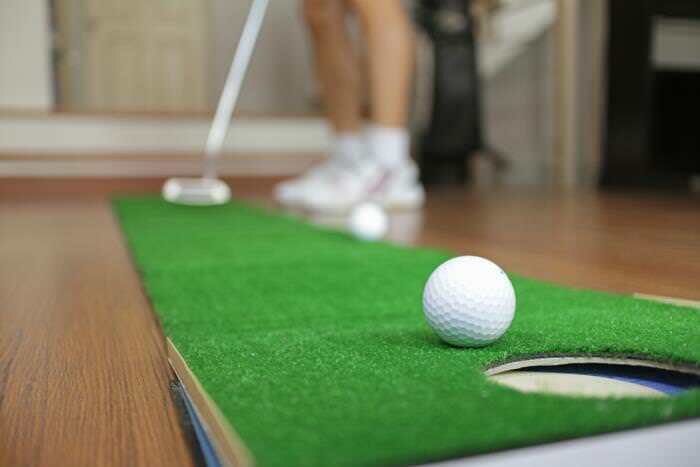 For an indoor practi ce, get yourself a putting green and indoor golf mat. Place it somewhere easily reachable, so you can improve your putting game every time you pass by. Places like living room are excellent. Oh just passing through the living room to get to the kitchen? Stroke one in. When you lose concentration at the office, stand up and play a few strokes. You’ll refresh your mind, and improve your short game at the same time. There are a lot of options for practice mats and artificial golf turfs you can choose from. If you want to create a complete simulat ion indoors, take one of the each type of surface and change them up from day to day. You can find some that are a combination of two or more types of terrain so that you can work on iron shots and short game from the same mat. As for going to the range, try to cover as much terrain as you can. Grass, dirt, shallow water, rocky surface, etc. If the range nearby doesn’t cover all that, try to find a bit different one if it’s not too far away. Adaptation is a good trait, and you will improve it drastically if you practice on various kinds of surfaces. Some golfers say going to the range is a better option than artificial turf, while other don’t agree with that. If you’re confident enough in your swing, then make the range your first practicing turf. If, however, you think you can use serious training, then go for the artificial turf. If your hit turns out bad on the grass, you will probably dig out a hole, do that several times and your arms will start to hurt as well. This can be avoided on a smoother surface such are artificial turfs. Don’t pay more attention to expensive golf clubs than on your strength and flexibility. You should start (and never skip) some basic exercises.The base is always the most important, and the base here are ankles and wrists. They can take a serious beating if you don’t handle the club properly or you skip the warm up. The base is always injury prevention, and most common injuries happen in the lower back and wrists. Before you start your practices, make a few lunges, warm up your wrists with the fast circular motion of the hand, do a few jumps, twists and in the end plank for one minute. That should warm up your lower back, wrists, ankles, and core after you finish planking. You can use light dumbbells to warm up your shoulders as well. Pick up the dumbbells and move your arms in circular motion. Use different directions to cover all three parts of the shoulder. You can lift your arms straight in front of you, then move to the side and go to the back, repeat that 15-20 times and your blood flow should increase in the shoulder area thus preventing any serious injury. Work on your body rotation also. You should use your hips more than your arms, overusing your arms can lead to chronic lower back pain. You can practice rotation by grabbing a towel and placing it across your chest. Keep your arms in place and swing back and forth until your mind learns to have a better control of them. For a more explosive swing, you can grab a plate for barbell pull it close to your body while your elbows are in the 90degreee position, and swing from left to right as fast as you can. Choose the weight that suits you the most, and when you get used to it, pick up a bigger plate. Good form means good swing.And not just that, but also is a major injury prevention. 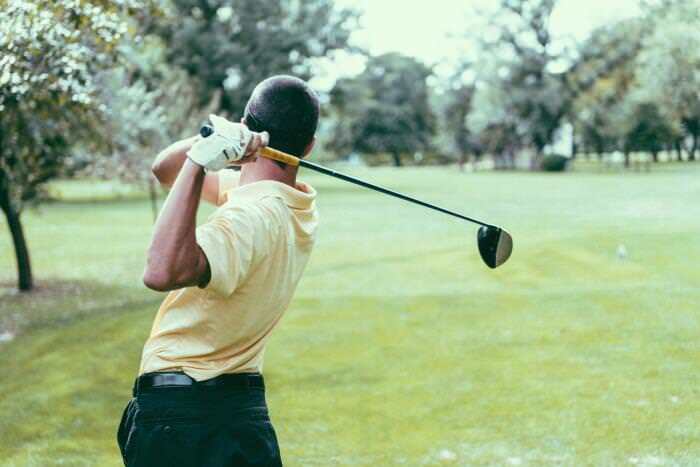 Golfers with a bad posture can experience repetitive motion injuries. Bad form results not only in injuries but also in bad swing and high handicap. Stand up straight and hold the club in front of you with the handle pointing at your belly button. Keep your arms and legs straight. Pull your shoulders to the back and stick out your chest. Slowly lean forward with your hips only. Your lower back must be flat and kept that way. Bend your knees very lightly and feel as if you are pushing your behind backward. Don’t over-bend your knees, do it slightly just to allow the club to touch the ground. Amateur golfers usually struggle with the position of the spine. What they lack is a body awareness, so when they’re told to straighten their back, they cannot do it properly cause they lack the body awareness. Once you get to know the feeling of a flat back and a good spine angle, everything else will be easy. Bad posture can often be a result of the lack of strength in the core region. That’s why completing that one-minute long plank is so important. When you strengthen your abs and lower back, you will be able to hold your upper body better at any leaning position. If you find that plank is too hard for you to do, then start with simple sit-ups until you are ready for the plank. This will lead to a good posture, good swing, and a much better impact. The first thing you should do is check your ego. Everyone has a weakness; they are just unable to admit it. There’s always a place for improvement; everyone can be better than they are. There are strategies how to identify your weakness and point the finger on the thing that was keeping you down. Track those for a couple of rounds, and you will slowly become aware of your weaknesses, and you can start to work on reducing them. With the data you collected during those few rounds, you can tell what your score for the round would be. Now you can determine what needs some work, being that your iron play, short game, putting, etc. You should also be aware of what’s considered average, and what’s above and below that average. That’s the best way to tell if you have much room for improvement in a certain area. When you take a look at these stats, you can notice that even pros only hit fairway about eight times a round. 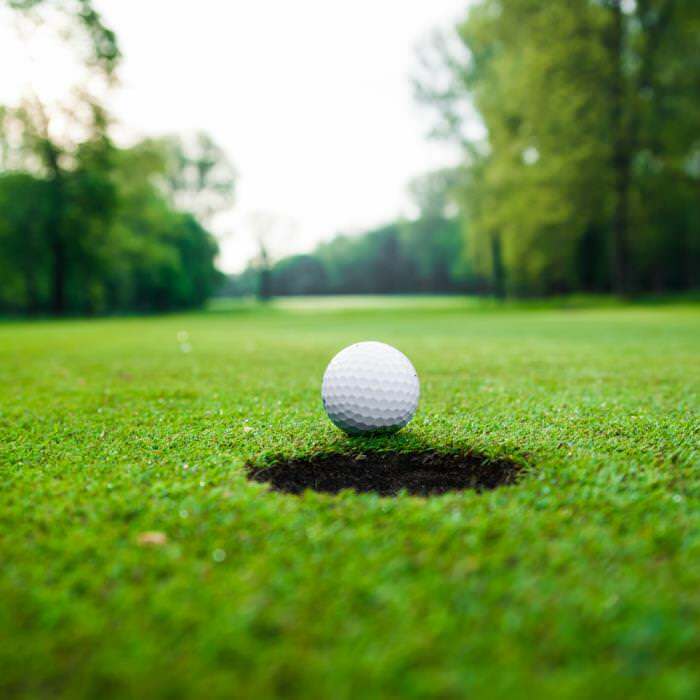 The average pro golfer hits the greens only 12 out of 18 times. While you try to identify your weakness, take into account what really needs work. For most of the people, the lost strokes are in their putting and short game. With this method, you can find the trends in your game and then work on improving your weak points until you overcome those weaknesses. There are a lot of different mistakes every beginner makes unconsciously. There are three main areas where everyone should focus. First is the long drive, and you will need to improve your swing speed to at least 70 mph. The final goal for males is about 100mph, and for females about 90mph on average. The second main thing is your short game accuracy, and the third is the putting game. It doesn’t matter if the club you bought is expensive and used by the pros or just a random cheap one you got a good deal for. We are all different, and the club that fits me well could be a bad match for you. If you notice you have constant troubles with your swing, try with some other club and see the difference. Also, when you hit a peak in your game improvement, it could be a good time to upgrade your clubs. With today’s unlimited flow of information online, people think that everything is easily resolved and it’s just a few clicks away. While this can be very true, browsing a ton of forums and watching one video after the other on YouTube can be more harmful than helpful. You don’t necessarily have to get professional help, but be sure that you’re not jumping from one point of view to the other. A lot of different people have a lot of different approaches and philosophies, so you might get tangled in the middle of the two completely different advice, which can only deter your process. Make a learning plan and stick to it, and it’s better to get a trainer as soon as possible. Before you start thinking what went wrong with that shot you’re not pleased with, check the grooves of your club. It's very important to keep the grooves of your club clean, especially on lofted clubs. Clean the grooves before you start the game and every next round. Once you create the habit, it will be much easier. Also, avoid the use of groove sharpener cause it can cause the corrosion to appear faster. 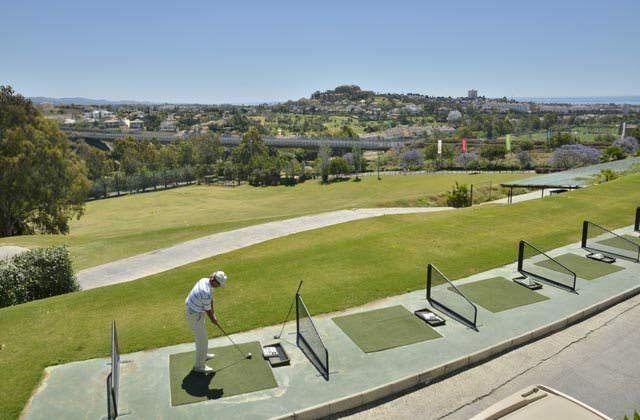 Although driving range is different game compared to the course, and you may think that you don't need the driving range if you had enough time on the golf course, but you shouldn't discard it right away. Golf is an investment in time and also your bankroll. The game of Golf changed over the years, and distance became more important than finesse and accuracy. It quickly became a trend to chase the longest distances. And because of that, many of the new players tend to swing harder than they should. Swinging too hard can be more counterproductive than useful. You can lose your balance and tempo, and keeping the rhythm of your swing is important to gain distance and control. Swinging too hard also can stretch your upper body and cause you to miss the center of the ball. Increase your swing power after you maintain the proper consistency and accuracy. Knowing your strengths and weaknesses and making better decisions are the things you need to keep in mind to start thinking like a pro.The pros are always discussing the benefits and cons of each shot with their caddies. 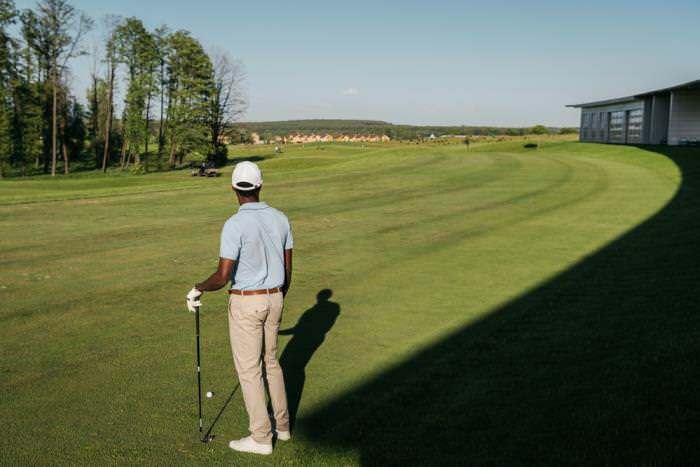 Weekend golfers don't have that kind of luxury, so here are a couple of tips on what goes through a pro's mind in certain situations. Using the exercises, we already covered you can get the better overall performance. Today more and more pro's practice Yoga and Pilates to strengthen their core and improve spine flexibility. You can get some of the tips from watching the pros play and the analysis provided by PGA to understand how they get so much power into their swings. When you can't go to the course, you can sit down and browse YouTube for some pro plays recorded. There is always room for improvement, and it's the best when someone takes a look at your game who already overcame those mistakes. Taking a few lessons from a pro can increase the speed of your advancement. If you're unable to reach an expert for advice, you can take a look at the tutorials online. Some pros are using different kinds of gadgets like golf swing monitors to get an instant info on their each swing. You can attach them to your glove and monitor your club speed, swing plane, tempo and hip rotation. It’s even possible to link it to an app on your phone, and you can com pare your stats to the pros. Being a professional golfer can’t happen over the night. It’s a long road of constant practice and improvement. All of the professional players you follow today started just like you, and day by day they got better and better until they have been recognized. Persistence is the key to every success in life; golf is no different. Being one of the sports that requires the most investment of time and money, it should be taken seriously from the start.